* Added many photos of Ginkgo pollen/seeds/ovule development . * Added photos of Ginkgo trees in Japan (Kawara) and Germany (Schwerin). 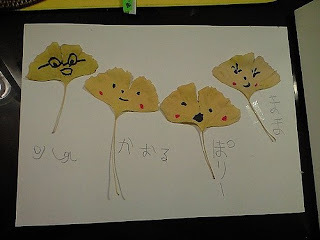 Lovely child's drawing on Ginkgo leaves. 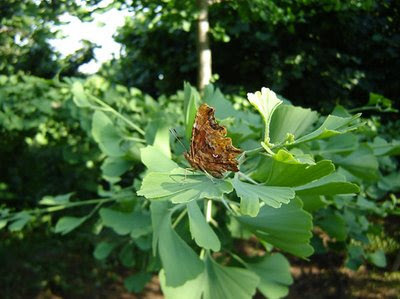 Beautiful photo of a Ginkgo with butterfly on a blog by Boriana Boeva. On the occasion of the exhibitions Frank Lloyd Wright: From Within Outward and Learning By Doing, the Guggenheim Museum New York and Google SketchUp invite amateur and professional designers from around the world to enter Design It: Shelter Competition. From now until August 23, you can submit a 3-D shelter for any location in the world using Google SketchUp and Google Earth. The GINKGO NEST came about from three sources of inspiration. The first was the beautiful GINKGO TREE. Its beautiful leaf shape and yellow color is often depicted in Art around the world. Originally found in China and often planted in Korea and Japan. The second being the OCTAGRAM form. The octagram has significance in many cultures. In ancient Japanese warfare it is the symbol for Stronghold/ Castle (a fortified structure). Third is the 12th century GUSUKU ramparts (now ruins and considered a UNESCO heritage site) in Okinawa, Japan. Made from blocks of local limestone. Japan has variable climate and unpredictable showers. Being flexible to the weather is a factor in the design. Two button up screen walls allow lovely breezes in. However button up canvas walls can be used if the weather is rainy, windy or cold. The structure is isolated and excellent for escape and contemplation. Because of earthquakes cast in place reinforced concrete is used. Textured with local limestone and coral aggregate being sandblasted and exposed to create a sense of warmth. The window panes are textured glass to mimic the textured concrete. However large untextured windows invite great views. Local limestone and coral aggregate is used to emulate the Gusuku. Subtle images of the Ginkgo are used throughout to tie it all together .The structure grows up off the brow of the hillside. A cozy bowtie plan creates two areas. One area considered a Study area with a curved reading bench and book case beneath. The other area for Rest with a comfortable bed. The name GINKGO NEST comes from the idea that two Ginkgo trees are embracing the structure (and vice versa) as any tree would cradle a nest. The GINKGO NEST would be situated overlooking the Pacific Ocean and the city of Kumamoto, Japan. The Ginkgo tree is the official tree of the city of Kumamoto and the symbol of the University of Tokyo. * New photo of Ohatsuki leaf: ovule (seed) grows on the leaf. * Added 3 new videos on my YouTube channel: Old Ginkgo tree in Japanese garden + Old Ginkgo tree in Anduze + Ginkgo ovules (seeds) in June - France. * Added videos of Ginkgo tree(s) in Japanese garden in Anduze, France. Huge male Ginkgo, 30 m, girth 4.88 m, c. 1856. I made this video in May 2009. Location: Anduze (France), Japanese garden of La Bambouseraie Prafrance. * Added photo of Ginkgo tree(s) in Japanese garden in Anduze, France. * New book by Arthur Sze on my Literature-page. * Added photos in photo/videos section: Ginkgo trees at new Rooftop Sculpture Garden San Francisco Museum of Modern Art. * New photo photospecial page: Bartholdi with Statue of Liberty and Ginkgo tree. If you are looking for rubber stamps depicting Ginkgo leaves you can found them at Artneko.com . * Added video in videos section: Sculpture and Ginkgos at Kröller-Müller Museum, the Netherlands. * Added 2 videos in videos section: "Ginkgo biloba: a tree that conquers time" made by two Harvard students + a poem "Ginkgo leaves in fall" by Ed Hiestand. "On June 28 (2009) ancient Ginkgo biloba trees were discovered in Tiantan village of Changshun County, Guizhou Province in China. There were two “ancestor” Ginkgo trees which were tightly surrounded by numerous “grandchildren” trees that vary greatly in thickness and height. The locals say that this “living fossil” is full of vitality in the summer and can produce over 4,000 pounds of seeds each year. Home for many species of birds, these trees are regarded as sacred by villagers. Villagers from near and far travel to the trees to make wishes, give worship, and pray for favorable weather conditions. The ancient Ginkgo is 16.8 meters (55.1 feet) in circumference, requiring the arm spans of 13 adults to encircle it. It is 50 meters (164 feet) tall, and the crown of the tree covers half an acre. 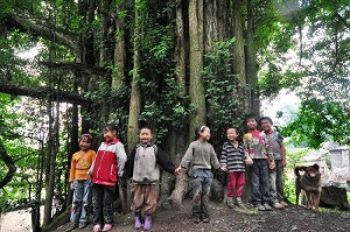 According to forestry experts, the tree is over 4,000 years old and is nicknamed “Chinese Ginkgo King.”" Article is here.